For quantitative determination of pyruvate and evaluation of drug effects on its metabolism. • Sensitive and accurate. Use as little as 10 μL samples. 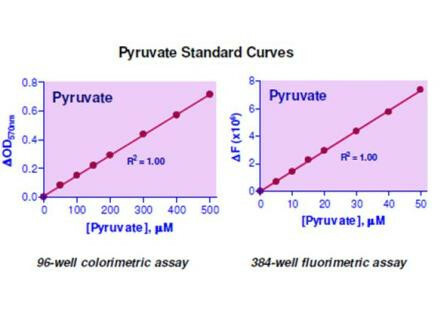 Linear detection range in 96-well plate: 2 to 500 μM (17 μg/dL to 4.4 mg/dL) pyruvate for colorimetric assays and 0.2 to 50 μM for fluorimetric assays. • Simple and convenient. The procedure involves addition of a single working reagent and incubation for 30 min at room temperature, compatible for HTS assays. • Improved reagent stability. The optimized formulation has greatly enhanced the reagent and signal stability. Pyruvate is a key intermediate in cellular metabolic pathways. Pyruvate can be converted to carbohydrates via gluconeogenesis, to fatty acids or energy through acetyl-CoA, to the amino acid alanine and to ethanol. Abnormal levels of pyruvate have been linked to liver diseases and metabolic disorders. Simple, direct and automation-ready procedures for measuring pyruvate concentrations find wide applications in research and drug discovery. 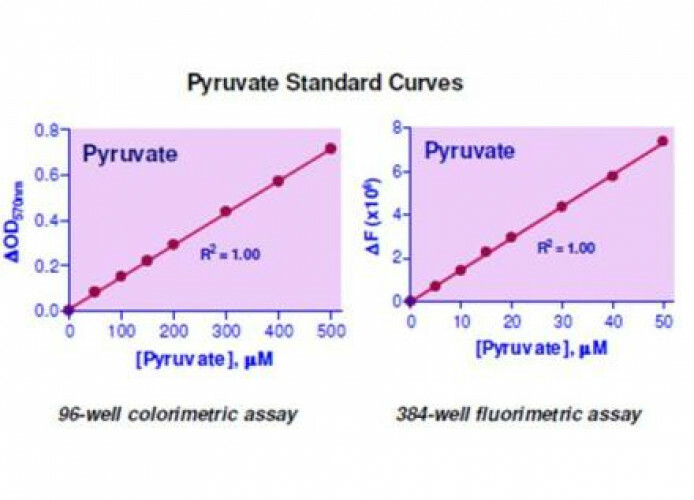 BioAssay Systems’ pyruvate assay uses a single Working Reagent that combines pyruvate oxidase and hydrogen peroxide determination in one step. The color intensity of the reaction product at 570nm or fluorescence intensity at λex/em = 530/585nm is directly proportional to pyruvate concentration in the sample. Applications For quantitative determination of pyruvate and evaluation of drug effects on its metabolism. References Assay: Pyruvate in Human cell lysate (Pubmed). 2. Wu J et al (2014). Pyruvate-associated acid resistance in bacteria. Appl Environ Microbiol. 80(14):4108-13. Assay: Pyruvate in E. Coli cells (Pubmed). 3. Cui Z, Gao N, Wang Q, Ren Y, Wang K, Zhu T (2015). BcMctA, a putative monocarboxylate transporter, is required for pathogenicity in Botrytis cinerea. Curr Genet. [Epub ahead of print] Assay: Pyruvate in Hyphae Tissue (Pubmed). 4. Darekar S, et al (2012). Epstein-Barr virus immortalization of human B-cells leads to stabilization of hypoxia-induced factor 1 alpha, congruent with the Warburg effect. PLoS One. 7(7): e42072. Assay: Pyruvate in Human cells (Pubmed). 5. Park MR, et al (2012). Transcriptome profiling characterizes phosphate deficiency effects on carbohydrate metabolism in rice leaves. J Plant Physiol. 169(2):193-205. Assay: Pyruvate in Plant leaves (Pubmed). 6. Cajuday, LA (2014). Carbohydrate Uptake in Water Buffalo Cumulus-Oocyte Complexes (COCs) Supplemented with Retinoic Acid During In Vitro Maturation. Philippine Journal of Science. 143(1): 43-48. 7. Fong, JE et al (2013). Moderate excess of pyruvate augments osteoclastogenesis. Biol Open. 2(4):387-95. Assay: Serum in Mice (Pubmed). 8. Chen, X et al (2015). Terazosin activated Pgk1 and Hsp90 to promote stress resistance. Nat Chem Biol. 11(1):19-25. Assay: Cells in Flies (Pubmed). 9. Yasid, NAB (2013). Metabolite analysis of Escherichia coli in response to changes in oxygen levels. Department of Molecular Biology and Biotechnology, The University of Sheffield. 1. Verma MK et al (2014). Integrated analysis of chronic lipotoxicity on muscle metabolism and stress and its reversal by antioxidants. Springerplus. 3: 251. Assay: Pyruvate in Human cell lysate (Pubmed).